From product visuals to animation to automated 3D system designs, my recent work has been challenging and rewarding. I've had the opportunity to utilize the tools I know best, while also discovering new ones along the way. VOSS approached me to create 3D renderings of their line of sparkling flavored water on a tight deadline. I utilized octane render to achieve the high level of realism that the client required. Maharam is a high-end textile company, owned by Herman Miller and based in Manhattan. I had the pleasure of working with them to develop their library of web imagery. Being a leader in interior design manufacturing from product and graphic design, to digital art and architecture, the scope of this project was huge, involving over 4000 textiles that had to be mapped onto 7 different base images. My job on this project was heading up the production, modeling, and lighting of all 3D elements, which included designing the digital system to automate the mapping of textiles to 3D furniture while maintaining real world scale and overall quality of products. Over the past two years I worked closely with Lab Series, a division of Estee Lauder, on a number of different projects involving product visualizations, web animations, specially designed display units, and final images for print. The image above is the marketing still for the new Future Rescue Repair Serum that was based on the animation I developed below. This animation involved a number of different software packages to achieve the exact look the client wanted. After about 2 design rounds the look that was finally settled on for the background image, came from an obscure fractal program called Apotheosis which was both fun and challenging to use. Osiao approached my previous company, shootdigital, about sculpting, 3D printing and gold plating a few of the ingredients from a line of their more recent products. The images above are rendered images of some of the pieces I sculpted for them using Zbrush. Using a Formlabs and a 3D Systems printer I have developed prototypes for manufacturing, and high end art pieces while also experimenting with various methods of finishing including 24k gold plating of 3D prints. This lowpoly skull planter was design for the reception desk at shootdigital and was printed on a 3D Systems powder based printer. It is created to be a fully functional flower pot equipped with drainage holes and a tray that catches excess water (not pictured here). This was the first prototype of the planter before she had teeth. Samuel Vanderveken, a Belgium based artist, commissioned me to recreate the figure pictured here from one of his recent murals.. The final piece was printed in resin then painted, with two pieces comprising the main body and three removable sticks protruding from the base. The Modoll is an upcoming project from Santiago and Mauricio that I had the pleasure to work on. I was responsible for engineering the doll to be fully posable. Along the way I 3D printed prototypes to ensure the final product was production ready. A series of cup cakes I designed. One was chosen, 3D printed and then plated in gold and nickle to be auctioned off for charity. The final piece up for auction. These are a few of the things I enjoy working on in my spare time. Based on concept art from the upcoming Bethsda Studios game Fallout. A quick study in aging the look of a material, mostly focused around the paint. 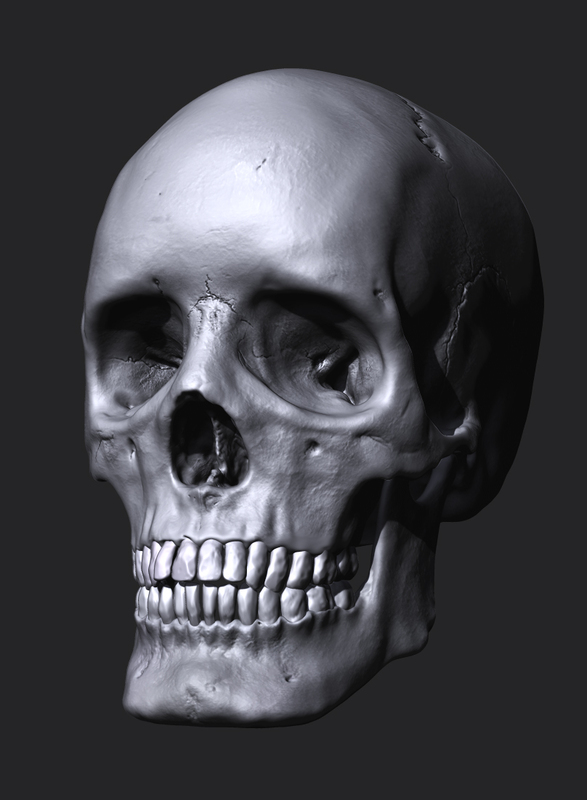 This study of a Female skull was based on life references, one of a few done in the last year. Been doing some studies of dance poses recently. You can see more of my studies on my blog. Feel free to contact me above or check out the About page to find out more.